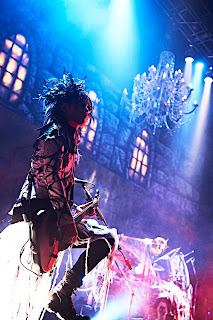 LIVE REPORT: the GazettE - THE DARK HALLOWEEN NIGHT [-SPOOKY BOX-] @ Zepp Tokyo | VKH Press – J-Rock & Visual Kei Coverage Worldwide! 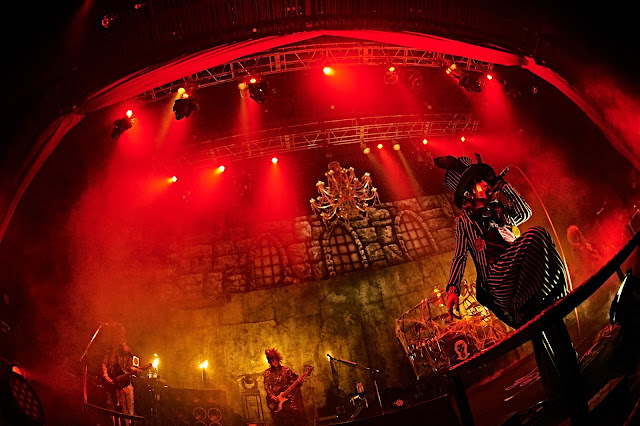 On a cold, rainy October night the GazettE held their first Halloween live, THE DARK HALLOWEEN NIGHT [-SPOOKY BOX-] at Zepp Tokyo. 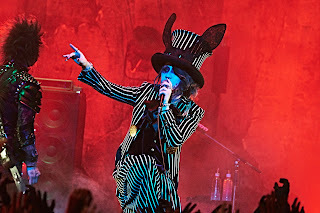 The band gave their fans a spooky night of non-stop energy, performing some of their most upbeat songs to date. 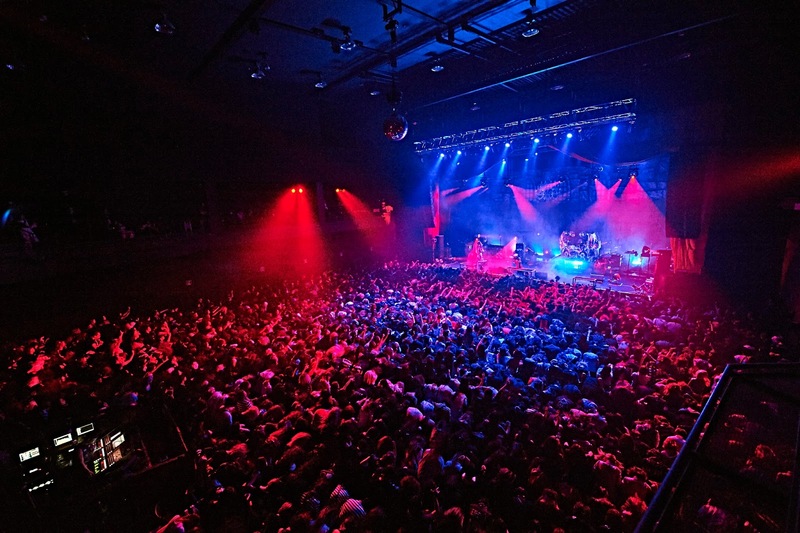 The tickets were limited to fan-club members only but the room was packed to bursting. The fans had come dressed to kill in all manner of Halloween costumes. Staff members had to ask the crowd to keep squeezing in a little more so that everyone could fit. Despite the squeeze, the venue was buzzing with excitement. 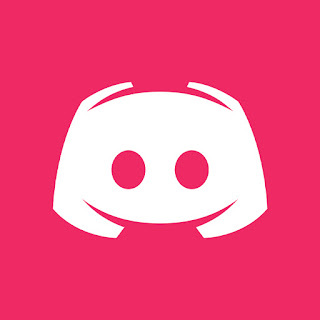 The room was plunged into sudden darkness signaling the start of the live. Excited gasps and murmurs ran through the room as creepy music began to play. The exit lights flickered on and off before darkening completely. There was no escape. A clap of thunder and the crowd screamed in anticipation when the shadows of the members loomed behind the curtain. While they were still hidden, the punchy intro of “INSIDE BEAST” began to play and the venue burst to life. The curtain pulled open slowly causing the crowd to go even more insane as the members in their fully costumed glory were revealed. 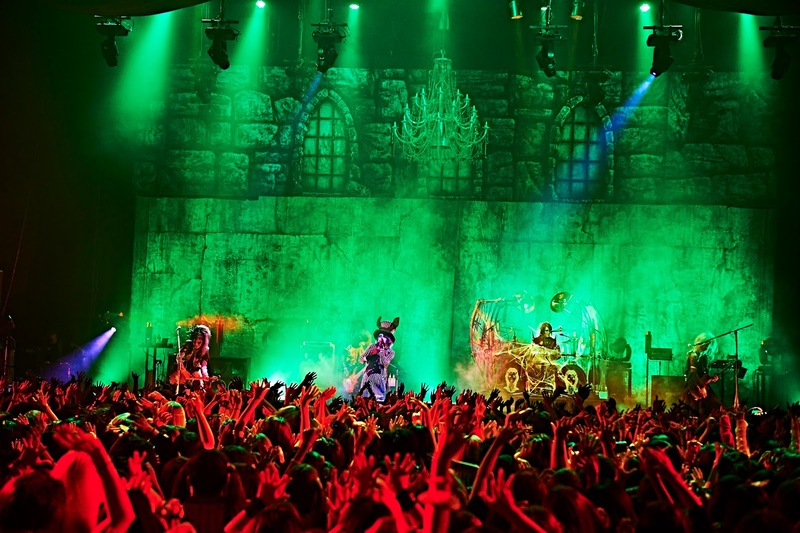 The stage was decorated to look like the inside of a castle dungeon with fog creeping over the floors. The size of venue put the band closer than usual to the fans and it made it easier for everyone to go all out. The opening drum beats and catchy riffs of “MY DEVIL ON THE BED” had the crowd pumping their fists in time to the beat. 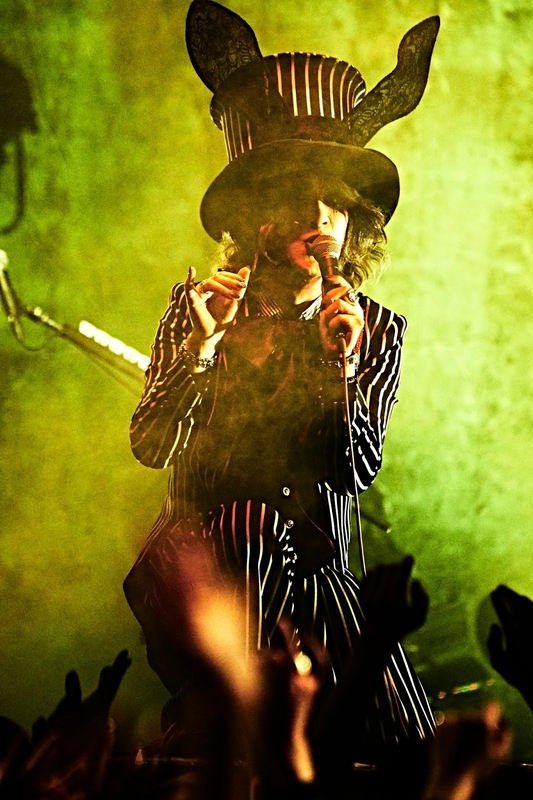 RUKI sauntered over to the back of the stage and picked up a shiny, bejeweled cane. The fans were whipped into a screaming frenzy when he brazenly licked it all the way from the top to the bottom. The band was clearly enjoying themselves and ready to pull out all the stops. 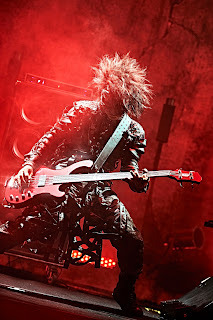 REITA’s bass was rich and reverberated through the room as he whipped his head from side to side in his corner of the stage. URUHA hopped up on the platform for his solo, grinning at the crowd. After that, the room went dark for a moment before exploding into action again with “VENOMOUS SPIDER’S WEB”. The stage was doused in acid green lights which added to the atmosphere. 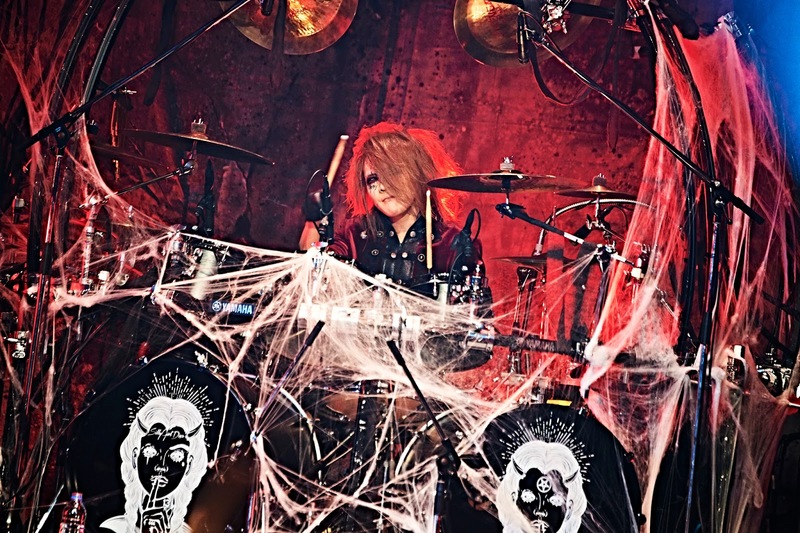 For the first break, RUKI welcomed the fans and wished them a “Happy Halloween”. With that, he did a quick call and response to get the crowd fired up again and they continued with “Red” followed by “GABRIEL ON THE GALLOWS”. The band’s energy was amazing and the crowd gave it all they had. They fed off each other’s enthusiasm, making the performances intense and incredibly fun. When the audience heard the opening of “Ganges ni Akai Bara”, they immediately began to dance. 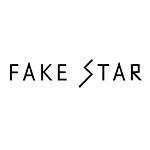 Although the song didn’t call for much headbanging, as one of their older songs, there was plenty of lively furitsuke which was done happily by the fans. The atmosphere was perfectly spooky with dim red lights and flaming torches in the back of the stage. 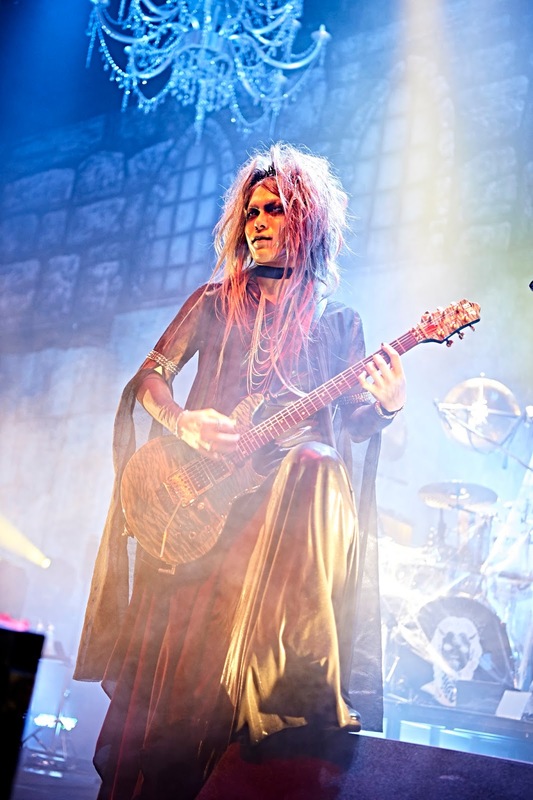 The stage went dark once again and a single spotlight shone on URUHA. He began playing a melancholy set of scales which got more and more fervent until it became the start of “BURIAL APPLICANT”. The pace of the song felt slower than it did in recordings and the result was a more complex sounding performance. Green lights projected distorted, abstract shapes onto the back of the stage which spun and swirled. It set the mood for “DISTRESS AND COMA” which calmed the mood but was no less powerful. RUKI’s voice had been pitch perfect thus far and during the performance, it was low and smooth and full of emotions. The song ended and the crowd remained perfectly silent, not wanting to break the atmosphere. 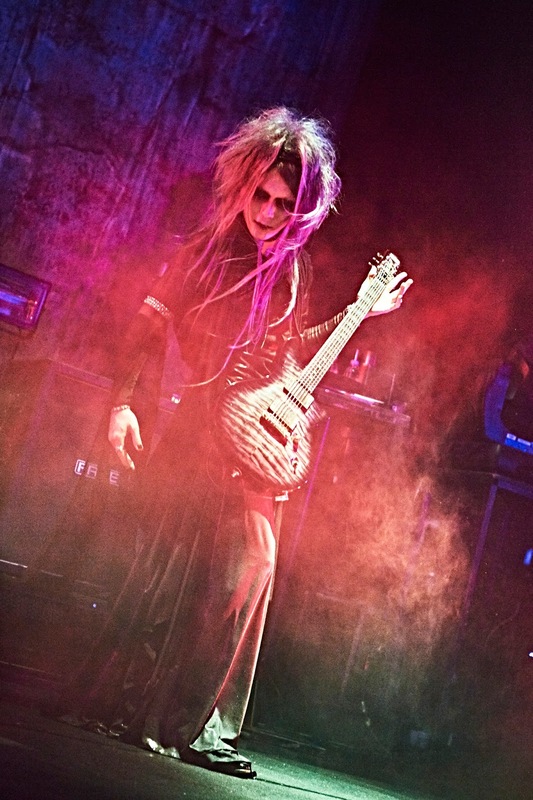 The silence lingered for a few breaths as RUKI became shrouded in fog. He began counting, breaking the quiet and starting “13STAIRS[-]1”. As the song built up to its frantic peak, the band’s movements became wilder to match. 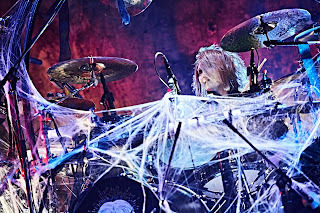 AOI spun around in rapid circles causing the frayed ends of his costume to flare out dramatically. 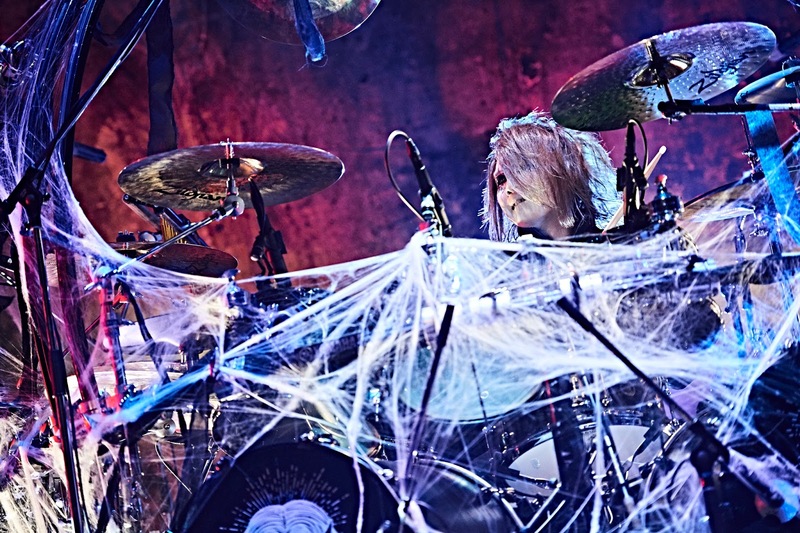 RUKI jerked his body around on the platform like he was a puppet controlled by strings. The audience threw themselves into headbanging until RUKI let out the final guttural scream, ending the song. After exerting themselves, there was another much needed break. 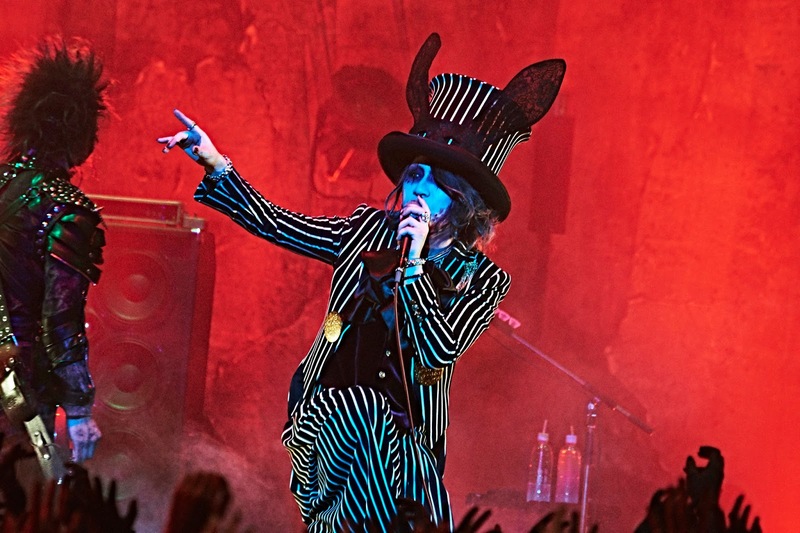 RUKI asked the crowd what they thought of the band’s costumes. The crowd shouted a resounding, “CUTE!” causing the members to laugh even more. “Hedoro” was up next and everyone was back to full power. The crowd participated by clapping first followed by wild headbanging then elegant furitsuke. The members left their positions to move around the stage, making faces at each other as they passed. 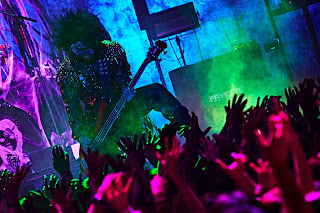 REITA, AOI and URUHA moved right up to the edge of the stage during “HESITATING MEANS DEATH”. 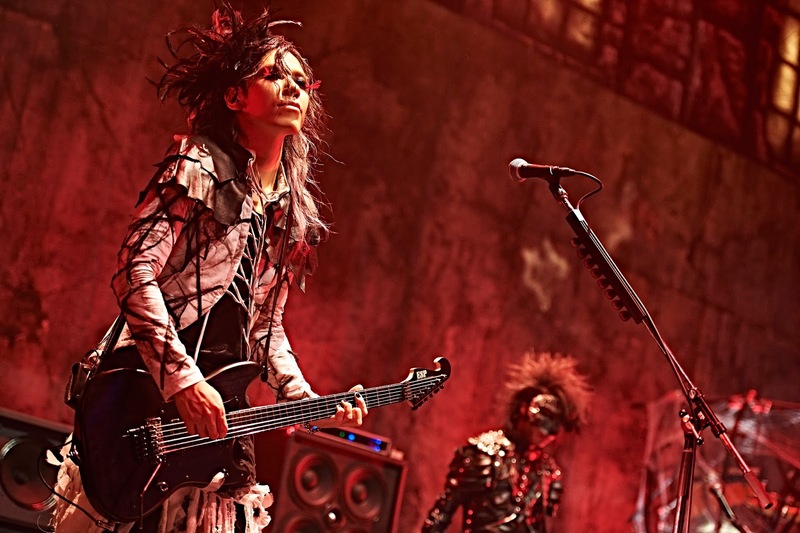 Then AOI and URUHA hopped up on the platform together, playing in tandem. They stopped long enough for RUKI to get the crowd fired up for the next song, “UGLY”. As usual, this was one of the most aggressive songs of the night and it was amazing to watch. Both the band and the fans went all out screaming and headbanging. 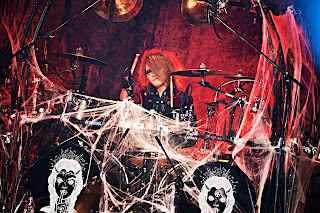 KAI’s intense drumming echoed through the venue as he pounded away with what seemed like limitless energy. During “HEADACHE MAN”, there were no lights over the crowd turning them into a dark, writhing mass. The result was perfect for the occasion. RUKI crouched on the platform, watching the crowd mosh from one end of the venue to the next. It seemed like there was no end to the energy as they continued with “ATTITUDE”. They started with a call and response, yelling “BREAK” over and over. During the performance the members were throwing themselves around the stage headbanging with abandon. REITA was stomping around the stage and together with his costume created quite a spectacular effect. The last song was “LINDA” and the whole room immediately began clapping in time to the beat. 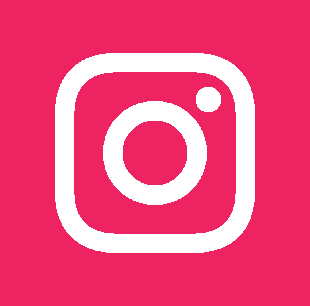 Once the song began, the front of the stage dissolved into pure chaos as the fans began to crowd surf, pelting themselves over the masses towards the stage -costumes and all. It was made even more chaotic when the band all moved as close to the edge as possible. At some point it looked like the fans were in danger of colliding with the members but it only seemed to make the performance more fun. Once it was over and the band left the stage, there was an immediate call for an encore. KAI came out first as usual to get the crowd pumped up. He asked everyone if they were having fun and mentioned that everyone was dressed in surprisingly cute costumes. He continued with a call and response, getting louder and louder until he screamed out his trademark “Kakatte Koi!! (COME ON!! )” and began drumming. It eventually turned into the drum beat for “Akai One Piece” but his face quickly turned to confusion when he realised the rest of the band weren’t coming out at all. He kept glancing backstage until finally the members all came out single file with huge grins on their faces. KAI stopped drumming immediately when he realized what was happening. RUKI grabbed the mic and announced that it was their beloved leader’s birthday. Instead of a cake, a staff member rolled out a tray of 5 pastries. He explained the “Russian” part was that one of them was filled with wasabi instead of cream. It looked like KAI had to deal with a good old-fashioned Halloween “trick or treat”. There was no escape. 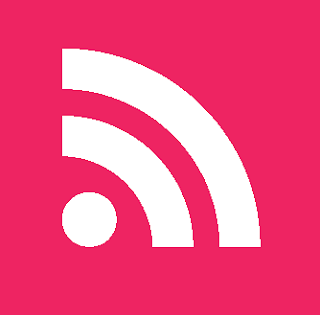 The crowd began to clap rhythmically as KAI picked one, turned his back and ate it in one bite. There was a moment of suspense, then gasps and shrieks as he toppled to the ground. Then the candles on his cake was lit and the crowd sang “Happy Birthday”. Once the laughter had stopped the band grabbed their instruments and played “Akai One Piece” for real this time. AOI and URUHA stood back to back on the platform while RUKI moved around the stage doing the dance together with the fans. 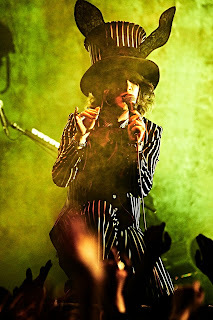 RUKI asked the crowd, “Shall we dance?” and crouched on the platform gyrating his hips during “Psychedelic Heroine”. AOI moved to the front of the stage strumming out the final riff with finesse, throwing his head back at the last note. 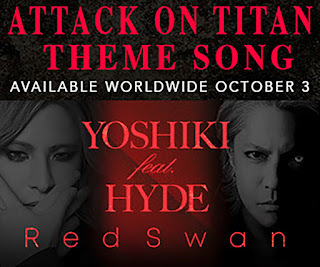 When RUKI pulled out a megaphone, the crowd started screaming, knowing what was up next. 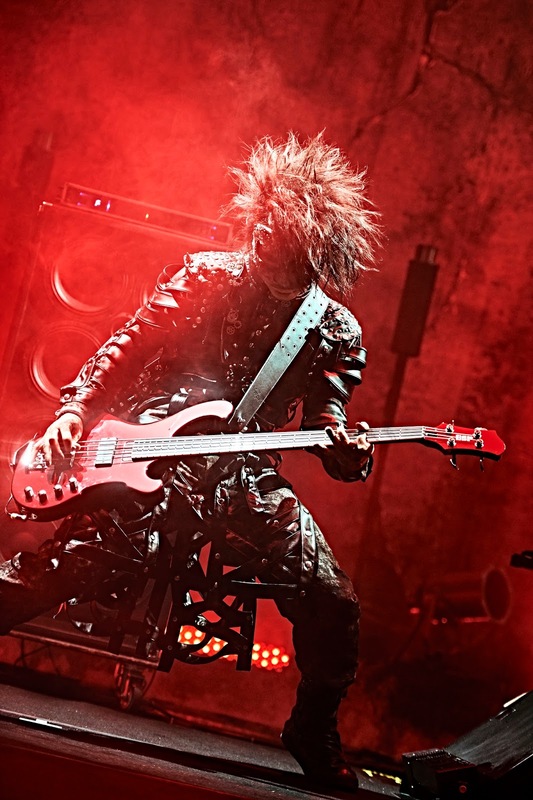 REITA’s jazzy riffs kicked off “SILLY GOD DISCO” which stayed true to its name and had the vibe of a party. A disco ball twirled overhead and the room was waving and dancing and singing at the top of their lungs. During URUHA’s solo, he and RUKI faced each other and then RUKI started dancing, dropping to his knees before they both turned away grinning. RUKI told the crowd afterwards that the band was having so much fun that they decided to do another Halloween live next year. Since the DOGMA tour was over, the band had been itching to do more activities, that's why they decided on a Halloween event. “Today flew by really quickly didn’t it?? 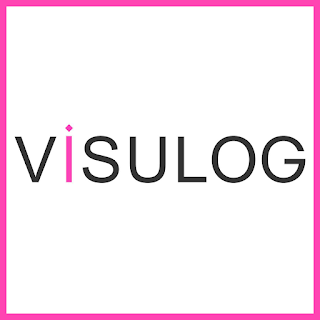 I don’t wanna go home just yet.” The crowd shouted their unanimous agreement. They had to make the most of the remaining time so without further ado, they continued with “Hyena”. The crowd’s energy was still top notch and the band responded in kind. RUKI and URUHA had the fans screaming again when RUKI playfully pressed a quick kiss to URUHA’s hair as they were performing on the platform. The final song of the encore was “TOMORROW NEVER DIES”.The fans started moshing and crowd surfing again and the band all moved around the stage, dancing and getting the audience to go even wilder. The band took their final bows and left the stage but the crowd still wasn’t satisfied. They kept screaming for a second encore until the members came out on stage one last time. RUKI’s final message to the crowd was, “Let’s meet again at next year’s SPOOKY BOX.”. Then once the cheering had stopped, he screamed, “WELCOME TO HELL!”, kicking off the final song of the night, “Kanto Dogeza Kumiai”. That was all it took to turn the venue into pure mayhem. Fans started crowd surfing in bigger numbers than before. There was no space to dogeza but the audience made up for it by headbanging with all their energy. The band played round after round after round of the song until everyone was spent, bringing their first Halloween live to an explosive end.